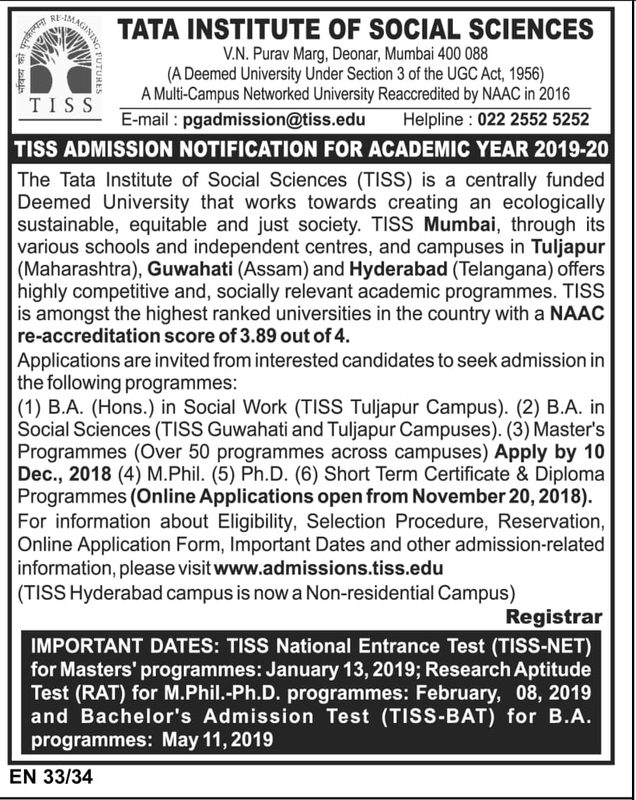 Tata Institute of Social Science has release the TISSNET 2019 PG Post Graduate Admission application form update on official website. After release the TISSNET application form is inviting to all eligible students whose are hunting the job just visit the home page of TISSNET application form select the course link fill the all details about the application form 2019. For more details about the TISSNET application form admission then you can read the full notification. TISSNET 2019 PG Admission online registration starting from 30th Oct to 10th Dec 2018 and admission entrance test will be held on 13th Jan 2019 (02:00 PM to 03:40 PM) TISSNET Entrance Test exam admit card will be update from 26th to 27th Dec 2018 these aspirants are applied the application form you have to wait for the some time if any latest update then we will update our website. Education Qualification: Candidates should be complete the Graduation from affiliated University. b) Candidates must have 2 years of professional work experience in any field after graduation. 14 SHSS Master of Public Health (Health Administration) HE Candidates should have (i) successfully completed a three year Bachelor Degree in any discipline, or (ii) four year Bachelor Degree in medicine, paramedical sciences, and other four year programme like pharmacy, veterinary sciences, engineering and law (iii) Candidates in their final year should complete all examinations and internship (wherever applicable) on or before 5th June, 2019. 15 SHSS Master of ( Hospital Administration ) HO Candidates should have (i) successfully completed a three year Bachelor Degree in any discipline, or (ii) four year Bachelor Degree in medicine, paramedical sciences, and other four year programme like pharmacy, veterinary sciences, engineering and law. (iii) Candidates in their final year should complete all examinations and internship (wherever applicable) on or before 5th June, 2019. (iii) Candidates in their final year should complete all examinations and internship (wherever applicable) on or before 5th June, 2019. 17 SHSS Master of Public Health (Social Epidemiology) PHSE Candidates should have (i) successfully completed Master degree in any discipline, or (ii) successfully completed Bachelor’s degree in medicine, paramedical and other four year programmes like pharmacy, veterinary sciences, engineering and law. UPG Candidates should have successfully completed Bachelor’s Degree in Engineering, Architecture, Management, Physical Sciences, Geography, Planning, Law, or Social Sciences, with an interest in habitat-related issues/sectors. Candidates in their final should complete all the examinations and internship (wherever applicable) on or before 5th June 2019. Candidates in their final year should complete all the examinations and internship (wherever applicable) on or before 5th June 2019.
c) Candidates must have 2 years of professional work experience in any field after graduation. 44 TISS-BALM (Banyan Academy of Leadership in Mental Health), Chennai centre M.A. in (Applied Psychology with specialisation in Counseling Psycholog) APCP Candidates should have successfully completed (i) B.A. Psychology or (ii) B.A. General with minimum three papers in Psychology. Candidates in their final should complete all the examinations and internship (wherever applicable) on or before 5th June 2019. Announcement of Admissions October 30, 2018, 6:00 p.m.